This Place of Worship was founded in 1823, and we understand it is still open. Christ Church has a graveyard on the south east side of the church, though it is now closed and most of the memorials have been removed. Building began in 1822 to a design by Thomas Rickman and Henry Hutchinson "in a plain neo-classical style". It was funded by a combination of public subscription and issue of shares, and intended for use of subscribers living in the housing built around the newly discovered "Gloucester Spa". According to Lewis's Topographical Dictionary of England (1831) it was dedicated to Holy Trinity, whilst at the time of a Map published by L. Bryant in 1841, when it was one of 9 churches shown, it was called "Spa Church". The Religious Census of 1851 (HO 129/336/4/5/5) records it as "Christ Church in South Hamlet which is extraparochial. No district has hitherto been assigned to an Church with care of souls". The return was completed by Robert B. Holmes, Perpetual Curate, of 3 Brunswick Square, Gloucester. 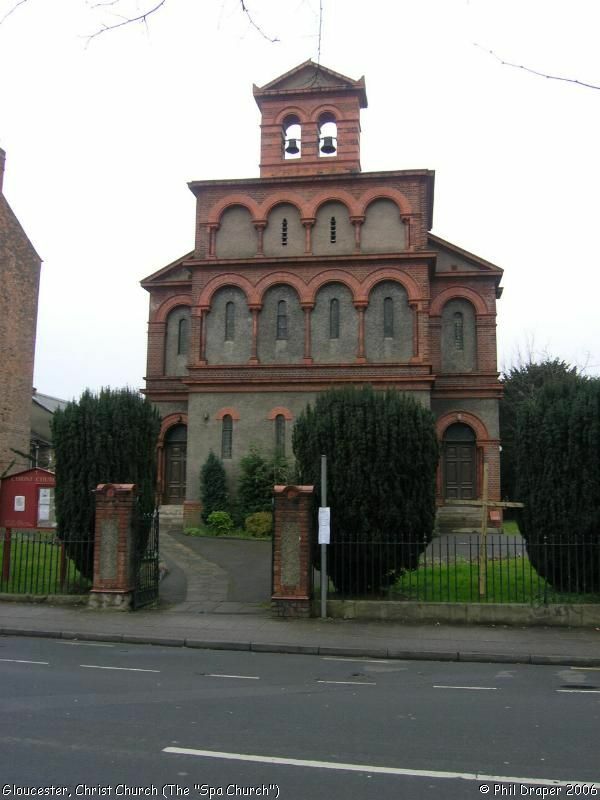 It was taken over by the diocese in 1877 as it could no longer pay its way, and its name was then changed from 'The Spa Church' to 'Christ Church'. Its early name was however restored in 1979, when as "Christ Church at the Spa", it was added to the united benefice of "St Mary de Crypt with St John the Baptist". The latter had been formed in 1952, when "St Mary de Crypt with All Saints and St Owen" was united with St John the Baptist. Christ Church (The "Spa Church"), Gloucester shown on a Google Map. Information last updated on 30 Dec 2014 at 08:43. Please also remember that whilst the above account may suggest that Christ Church (The "Spa Church") remains open and accessible, this may not remain so. This Report was created 19 Apr 2019 - 09:43:00 BST from information held in the Gloucestershire section of the Places of Worship Database. This was last updated on 7 Feb 2019 at 07:45.